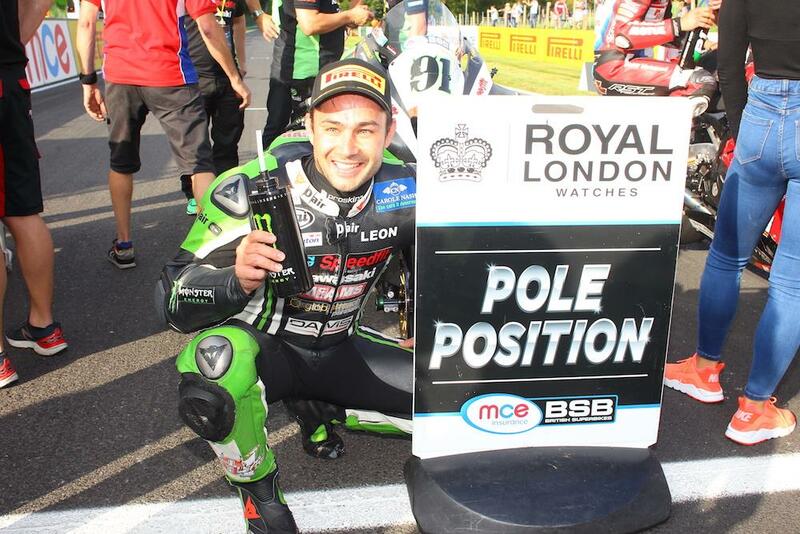 Leon Haslam became the fastest ever man around Lincolnshire’s Cadwell Park this afternoon as he beat Shane ‘Shakey’ Byrne to pole position for tomorrow’s opening MCE British Superbike race. Haslam’s time of 1’25.932 was 0.15sec quicker than arch rival Byrne, which sees him start from pole position for the first time since Oulton Park. The result comes after a challenging first day for the JG Speedfit Kawasaki rider, which saw him crash out at the top of Cadwell’s infamous mountain before suffering technical issues in the afternoon. “To get the fastest ever lap of Cadwell on two wheels is mind-blowing really, I didn’t expect that so we now need to put it together for the races,” he told MCN. “Shakey has been quick from the get-go here and we didn’t have a very good Friday at all with a crash and then an issue in the afternoon session. The cooler track temperatures threw a bit of a spanner in the works this morning but the temperature was back up for the afternoon. “We’ve got strong race pace and I’m feeling confident but I know Shakey’s been working on it too and you can see he’ll be competitive.